How awesome is my wife? Walking in the house with arms full of groceries I said, “I accidentally offended a Christian woman while talking to the flowers at Kroger.” Cathy didn’t look up from the paper she was writing. She wasn’t surprised about any of the phrases in that sentence. She simply nodded and said, “I’m sure she’ll survive.” Just another Sunday I went skipping to the store with a song stuck in my head, offended religious people, and had a conversation with some lilies. No chiding. No worries. Nothin’ to see here. That’s an awesome wife. Of course, it helps that she’s been living in the chatty internal musical that is my life for a long time now. I have always talked out loud to everything around me. When I park the car I pat the steering wheel and say, “Thank you.” I talk to food I take out of the oven (“Don’t you look pretty?”), I talk to the dog water bowl (“Why you so empty?”), the television (“That was a great show, thanks.”), clothes going into the dryer (“It’s gonna be warm but you can handle it.”) and coming out (See, you look swell.”). So, the talking to flowers part wasn’t a shock. The rest? Well, what do you expect when I’m allowed out of the house on a blistering Sunday afternoon in basketball shorts whistling musical theater numbers? Shall we dance? Shall we dance? Impressively, I remembered every word of the song. What did I forget? That Mechanicsville (the nearest town with stores) is home to roughly 3 kabillion Christian churches which all release their congregants sometime around noon each Sunday. 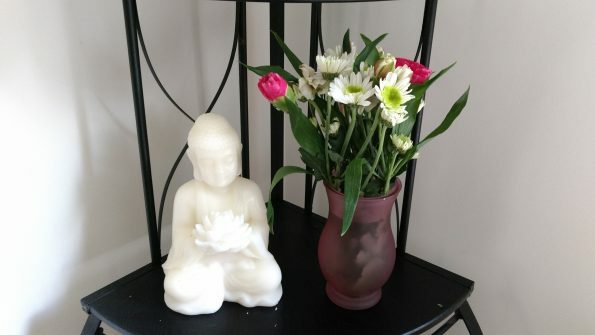 It was one of the few ninety degree days we’ve had this summer, and I arrived at the store wearing shorts and a T-shirt, whistling softly with a list that included veggies for dinner, treats for beagles, and some fresh cut flowers to go beside the Buddha in our kitchen. Kroger was packed with over-dressed, word-weary, cranky people. One woman pushed my cart out of her way while I was picking out flowers. Another man was angrily muttering and sticking his arm in front of me when I stopped in front of the apples to see if they were on list. I didn’t complain. I got it. They were hot, they were tired, their “day of rest” was nowhere near peaceful, and there wasn’t enough room for anyone to breathe, think, or be. No time for manners. No space for patience. Here was this smiling, bouncing (my secret dancing looks a lot like I’m on an invisible pogo stick), heathen in shorts and sandals in the middle of things. It was all too much. Somehow, I made it to my car in one piece. A nice SUV with one of those PRAY bumper stickers was parked beside me. I opened the trunk, blocking my view from that side and obscuring a sharp-dressed dad, skirt and heels mom, and 2 middle-schoolers who were exiting their vehicle. At that moment, all I was thinking about (besides that song) was whether to put the cut flowers in the front seat with me or keep them in the back with the groceries. I found a safe looking niche and nestled them in. “UGH!” The Christian woman said, loudly. It was my first inclination anyone was nearby. I put down the trunk to discover myself face-to-face with her. She looked straight at me, her lips curled in disgust as she frowned. She had a cross around her neck. I had a mala dangling from my wrist. I smiled. 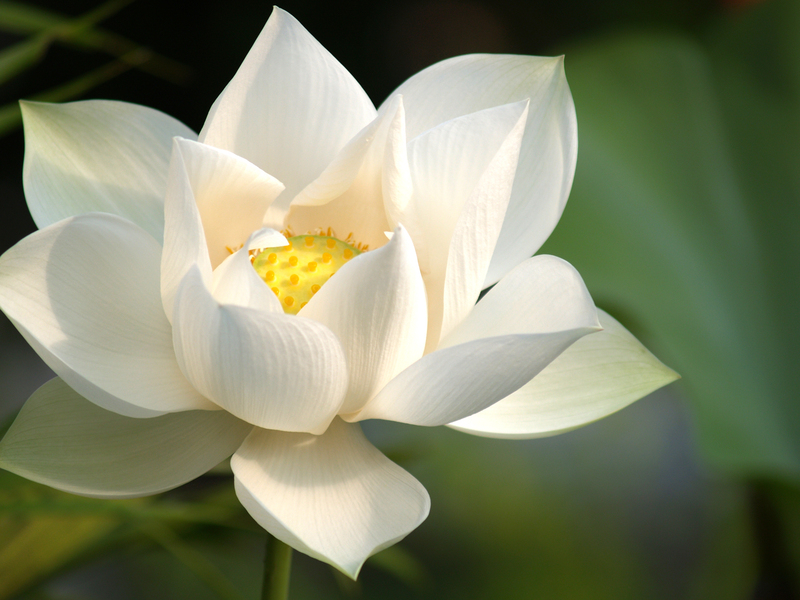 She gave me a hissing sigh, rolled her eyes, then put her arm on the back of one of her kids and guided them hurriedly away as if the car may explode at any moment, burying her in lotus petals and compassion. Shall we then say “goodnight” and mean “goodbye”? I would love to say I’m so thick-skinned and self-assured that her judgy rejection slid off me like cookies on a non-stick sheet. But it didn’t. I felt the sting. Even when I started singing loudly on the way home I was covered in the residue of her derision. My good humor remained, but it was tempered with those feelings you get when you've been put on notice that you are outside of the lines. In one moment of interaction we got to experience the truth about “tolerance” versus “acceptance.” I see the “Teach Tolerance” bumper stickers a lot (and their more friendly cousin – Coexist). I hear the pleas and language of tolerance in many places, and it has always been as unsatisfying to me as cotton candy for dinner. Even "coexist" doesn’t provide long-term nourishment. I didn’t know why until I sorted through my feelings about this experience. Tolerance means she didn’t stab me in the parking lot. She didn’t call security to have me removed, or stop and force me to confess (she thinks) it is wrong to offer anything to Buddha. She tolerated my presence for the few moments my circle met hers, non-verbally expressed her opinion, and left. We co-existed in that hot humid space. Not peacefully, not happily, but functionally. What would acceptance look like? In this briefest of moments, would it look like a smile? A nod? A murmured “hello” as two strangers found themselves face to face? At best, it would be a neutral space between us, with nothing but air and acknowledgement of another sentient being at close range. Acceptance would have offered her a chance to save energy. There wouldn't need to be display of displeasure. She wouldn’t have to draw a line between us. She wouldn’t need to scurry away. She could just be. Acceptance doesn't mean you approve. It means you understand the value of the person with you to make their own decisions about life/faith/being. And then, the mirror turns just long enough to let me know she’s not the only one who could have saved some energy that day. I am sad she doesn’t understand that flowers for my kitchen Buddha give us such joy and brighten the whole room; that we aren’t engaged in worshiping a false god. We aren’t worshiping anyone. We are showing our gratitude for teachings that make our life better, and respect for the teacher. It’s not really different than taking an apple to the lady who leads your Sunday School class. And yet, I am aware she is also sad – in a mask of offense/anger – that I don’t recognize or follow her life-honored belief that Jesus is the only way and the only one. Truth is – I had the same feelings about her “Pray” bumper sticker as she had about my flowers. I just waited to get in the car before rolling my eyes. If acceptance is the lesson, I need to slot myself in the student’s seat, not behind the teacher’s desk. In fact, we all do. Acceptance – recognizing someone’s sovereignty of belief, and dignity of being – frees us from not only the walls built by judgment, but the energy spent on ill will, the time lost to replaying the episode, and the illusion that we are disconnected. Acceptance allows us to remember we are all in this together. That’s the difference. Tolerance is a space you give to others. Acceptance is a gift you give to yourself which allows you to see the ties between us, no matter how different we are. Tolerance may spare you from discord but acceptance keeps you from being alone. Acceptance is an acquired behavior in our fractured world. Before it becomes a reflex, it will require some exercise, repetition, and reflection. To be who you are in the world, and letting others be themselves as well, is a treasure way worth the effort. I’m willing to try. How about you? Posted in Acceptance, Buddhist Basics, Common Voices, Compassion, Interconnected, Real Life and tagged Acceptance, Basics, Buddhism, Interconnectedness, Judgement, Tolerance.